First Bank Nigeria like it’s name entails is Nigeria’s first bank ever, it was launched in the year 1894. Meaning it has been in existent for more than 125 years now.This post will explain to anything you need to know about the first bank mobile banking app and how to get started with it. First Bank Nigeria, has created easy ways for their customers to perform banking transactions, without visiting any First Bank Branch. They’ve been able to achieve this by creating their Internet Mobile USSD banking, Banking platform, Mobile Banking App and other helpful services. 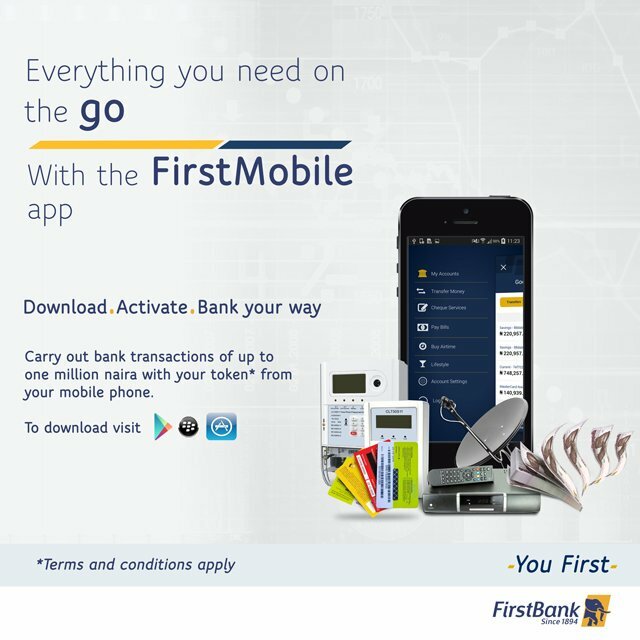 There are lots of transactions you can perform with First Bank Mobile Banking Application, with it’s special USSD code being *894#. You can check your account balance, transfer funds(money) from your account to another account (both for first bank and other banks in Nigeria), buy airtime for yourself and or others and so much more. 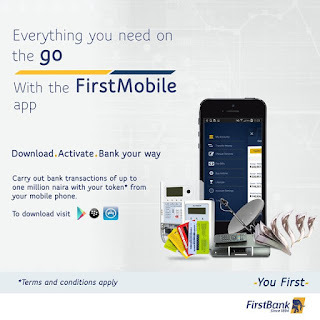 Download and Install the one with First Bank’s Logo. Enter your First Bank issued Naira Master Card or Visa card details and pin. An OTP code would be sent to the phone number linked to your First Bank Account. Create a unique 5-digits pin, called “MPIN” which you will be using for subsequent logins. Choose two security questions and answer it. Create à 4-digit transaction pin that you’ll be using to authenticate or confirm transactions. If you want to check your first bank account balance just Login into the App. Your account balance for your account(s) would be displayed to you On the homepage of your account once you login. From the drop down, select “Transfer Money”. Select the Account that you wish to transfer to, if it is your other First Bank Account or another First Bank customer’s account, other banks or the other listed account options. Input the details of the Account you wish to transfer to and the amount. Enter your 4-digits transaction pin to authenticate the transaction. NOTE: There’s a limit to amount you can transfer with the transaction pin. If you want your transaction limit to be increased, apply for a hardware token at a First Bank branch close to you. From the drop down, select “Buy Airtime”. Select the network you wish to buy airtime from on the next page, . Input the number and the amount you wish to transfer. Enter your 4-digits transaction pin to confirm the purchase of the airtime. From the drop down, select “Account Settings”. Click on change mPin or Transaction Pin (whichever you wish to do). Input your old mpin or transaction pin. Enter your new preferred mPin or Transaction pin.